This FREE FEATURE allows you to add calling time to your phone card once your minutes start to run low. This way you get to keep the same PIN number. This FREE FEATURE will recognize your caller ID and does not ask you to enter your PIN. Register up-to 10 phone numbers you commonly call from. FREE FEATURE allows you to program speed dial numbers to your PIN so that you don't have to enter lengthy phone numbers you commonly call. This FREE FEATURE allows you to use nationwide local access number that helps 90% of our customers achieve substantial savings on their calls. PINZOO is the Largest Seller of Prepaid Products and is an eBay PLATINUM PowerSeller® with 100% Positive Feedback from our valued customers. We have served hundreds of thousands of happy customers and look forward to serving you. For domestic calls (including Canada, Puerto Rico and the Caribbean) dial: 1 + area code + Number. For international calls, dial 011 + country code + city code + Number. For additional calls, don’t hang up. Press and hold the # button and follow the prompts. For Domestic Customer Service please call Toll-Free 1-888-697-4696. Para llamadas en los E.E.U.U, Canada, Puerto Rico y el Caribe, marque 1 + código del área + número del teléfono. Para llamadas internacionales marque 011 + código del país + código de la ciudad + número de teléfono. Para llamadas adicionales NO CUELGUE. Oprima la tecla # y siga las instrucciones. Para obtener servicio local al cliente del dia llame al 1-888-697-4696. All PINs are delivered via E-mail instantly. 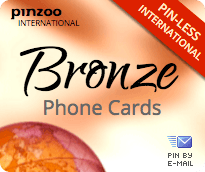 Purchase your PINZOO Bronze INSTANT PIN online and have it delivered instantly via email. Your PINZOO Bronze INSTANT PINs will also be made available online via your secure account order history page. Hours: Mon-Fri 9am to 5pm PST, Sat-Sun 9am to 12pm PST. Rates listed are based on using our local access numbers. An additional half a cent per minute will be added for using our toll-free access number. For more information, click here. Calls billed in 5 minute increments. A U.S. payphone surcharge of 99¢ will apply. A 99¢ service fee applies at midnight after the 1st call and weekly thereafter. Card expires 90 days after 1st use and can be re-activated for another 90 days if more minutes are added. To add minutes to your card, select the recharge option once you login to your account. Calls placed to wireless phones may be charged at higher rates. All rates and fees are subject to change. For the latest domestic and international rates, specific terms and conditions, please call us toll-free 1-888-697-4696. Service provided by Super Prepaid, Inc.